You. Me. Ride This Crazy Train - Adventures and Observations on The GO: How is this even remotely okay? How is this even remotely okay? That's NINE parking spots wiped out by this guy. 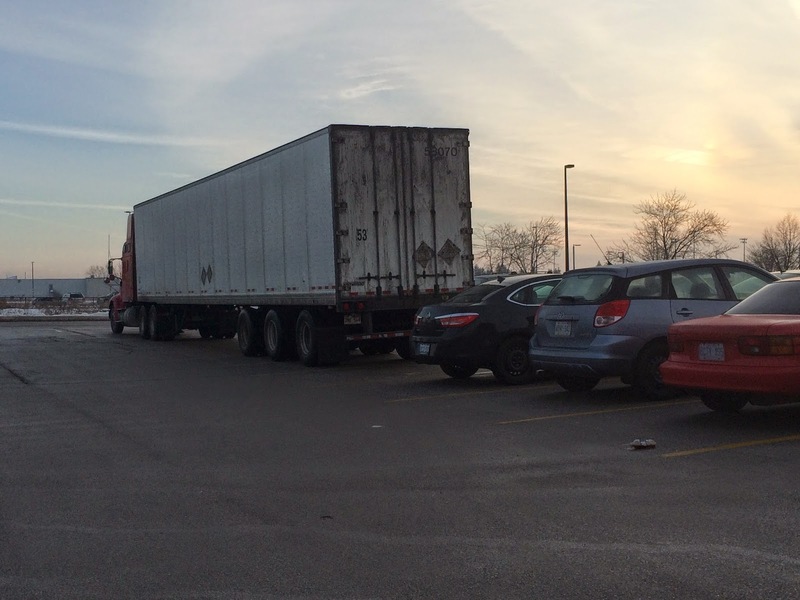 Why is an 18 wheeler doing at a Go Train Station parking? Is there a tow truck strong enough to haul away this trailer? Don't know but Transit Security is on its way! My guess: the driver pulled over to sleep. I would prefer them to do that in a parking lot and not on the side of the road. Here's hoping he woke up and moved shortly thereafter. If that trucker's not doing any business wit GO Transit isn't he/she trespassing? I've seen this done in mall parking lots (both trucks and school buses) but never in a go lot...yet. GO lots are private property and are to be used by only GO passengers and staff. Does the kid go off-roading? For my Milton peeps. I gots you. So don't buy a condo near railway tracks? And say no to bag riding! It's like the song of my people! I'll just park here. Yep, that'll do. But what if I'm blind? Shouldn't that get fixed? Because safety? What a fantastic morning!!! Not.